David K. Germany is Senior Vice President and Commercial Relationship Manager in Regions Bank’s Government and Institutional Banking Group. He manages commercial client banking relationships throughout the North Central Alabama Region. He has negotiated and structured commercial banking deals with values over $2 billion since 2007. 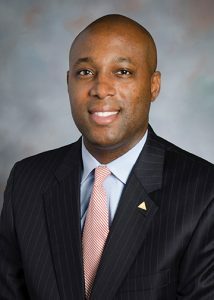 He graduated from the Regions Bank Management Associate and Commercial Credit Training Programs in 2003, and recently completed the bank’s emerging leaders program in 2011. He became a Certified Treasury Professional in 2008. An active participant in various economic, civic, and community affairs with several organizations, Germany currently is a member Birmingham Business Alliance Board of Directors, AG Gaston Girls and Boys club advisory council, and The Club Junior Board. A native of Birmingham, Alabama, he received his Bachelor’s degree of science in Investment Finance from the University of Alabama in Tuscaloosa, Alabama and an MBA with a concentration in finance from Emory University’s Goizueta School of Business in May of 2013.